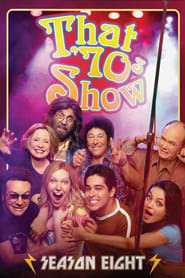 The eighth and final season of the American comedy television series That ’70s Show premiered November 2, 2005 on Fox in the United States. The season ended on May 18, 2006 with an hour-long series finale. The eighth season was the first and only season without the show’s star Topher Grace who portrayed Eric Forman, the central character, since he left the series at the end of the previous season. This season also marked a major change in the series, as a new character was introduced to take Eric’s place named Randy Pearson and the departure of Michael Kelso, who was portrayed by Ashton Kutcher. Kutcher actually quit the show at the end of season seven but remained on the series for five episodes during the eighth season. He appeared in the first four episodes to give closure to Kelso and he appeared again in the final episode titled “That ’70s Finale”. Topher Grace also returned for the final episode but his role was both brief and uncredited. Also, Leo returned as a main character since his return to the series in the seventh season. Many plots of the season involved Donna’s new relationship with Randy, Jackie falling in love with Fez, Hyde getting married to a stripper named Samantha, Kelso getting a new job and moving to Chicago, and the Formans adjusting to an empty nest which is too empty for Kitty and not empty enough for Red due to the kids’ presence despite Eric’s absence.